Interdisciplinary degree programme with innovative specializations in "Operating theatre engineering/Cardiovascular engineering" and "Biomedical Technologies"
During the foundation level studies in the first and second semesters students take subjects from medicine, engineering and the natural sciences, such as anatomy, physiology, clinical chemistry, computer science, physics, electrical engineering, materials engineering, mechanical engineering and design, so that they are prepared for subject-specific medical engineering. Advanced level studies are taken over five semesters and include a practical study semester. They combine traditional engineering content with workplace-relevant projects from hospitals and industry and a wide range of specializations and electives. The "Biomedical Engineering" and "Operating Theatre Engineering/Cardiovascular Engineering" specializations in the advanced level studies focus either on the development of new medical engineering devices and processes of monitoring, therapy and diagnosis, or on heart-lung machines and organ-support systems. Electives and further specializations, e.g. in the areas of biomechanics, intelligent implants, monitoring systems, or app-based applications are also offered. The Medical Engineering programme is an accredited cardiovascular engineering training centre for the European Board of Cardiovascular Perfusion (EBCP). The development of innovative processes and equipment for medical supervision, therapy and diagnosis requires deeper knowledge of the engineering of medical devices and systems. Students are given in-depth instruction in special lectures, practicals and in the University's own research projects. This specialization in the field of technical medicine sets the standard in a completely new career field. In the hospital, engineers are the link between doctors and technology. They are involved in patient care and the use and configuration of complex systems. To be qualified to do so, in-depth medical knowledge of the heart-lung machine and organ-support systems is taught. 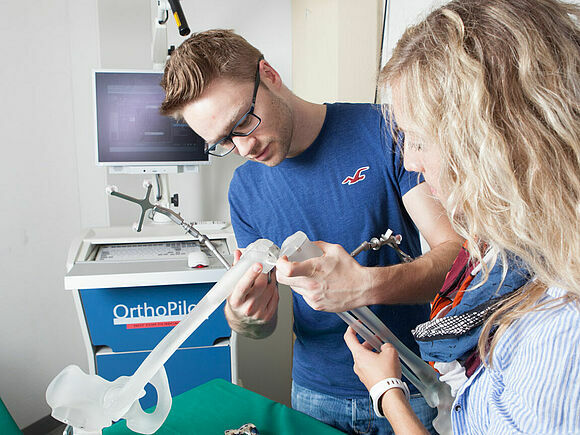 The focus of this specialization is on technical understanding of operation devices and systems such as the heart-lung machine, and additional medical know-how is taught to provide the necessary qualification. In addition students have the opportunity to obtain the additional qualification of the European Certificate of Cardiovascular Perfusion (ECCP) from the European Board of Cardiovascular Perfusion EBCP during their studies. This programme is one of the few accredited training centres in Europe. Intelligent sensors and developments from medical engineering are increasingly being used in the field of sport, fitness and rehabilitation. Personalized medicine, the development of individual training equipment and the supporting aids require sports medicine principles such as sports physiology, sports medicine, sports medicine therapy devices and a knowlege of biomechanics. Engineers with interdisciplinary training are in demand in the growing field of sport and health at the interface between sports medicine and technology. The current Study and Examination Regulations for the Medical Engineering - Clinical Technologies study programme can be found here. Module descriptions will also be available shortly. Key technologies such as minimal invasive techniques in surgery, cardiovascular perfusion, organ-support systems, imaging processes, computer-aided communication technology and app-based applications offer innovative fields of work in medical engineering. Medical engineering is a technology of the future and is the sector has the greatest potential for growth. The aim of the Medical Engineering degree programme is to train engineers to work at the interface of medicine, patient and technology.